Look familiar? 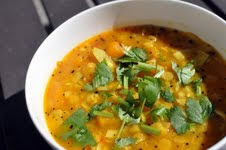 Yes, it's Janet's Butternut Squash, Coconut and Lentil Stew. Congratulations Janet! That is one tasty looking soup. I will be doing November's No Croutons Required. Check back tomorrow to find out the theme. And now an apology! A big apology to Heather over at Gluten Free Cat. 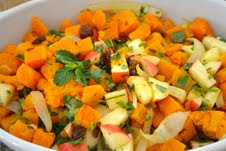 I somehow missed out her gorgeous Butternut Squash & Apple Salad. Please help me make up for my gaff and pop over there to admire this scrummy salad. Congratulations to Janet. Lookign forward to seeing what November challenge brings. LOVELY soup and CONGRATS to Janet too ~ there were some wonderful looking recipes this month, thanks Jac! Aw, you are sweet to link to my salad! And congrats to Janet, what a delicious soup! Look forward to trying it.